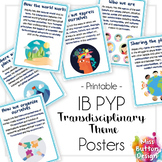 Posters for displaying the PYP IB Transdisciplinary Themes in your classroom. One poster for each of the 6 themes. 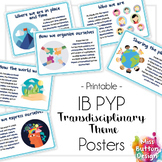 A collection of simple posters of each of the IB PYP Transdisciplinary Themes (six in total) illustrated with beautiful photographs. Posters are A4 size, but can be resized as needed as very high resolution photos are used. 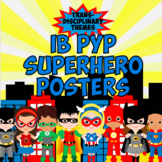 This product contains posters for all six PYP Transdisciplinary Themes. There is a poster with each theme and assorted posters with breaking down each theme. Each poster is on a chevron paper with a bright colored frame. 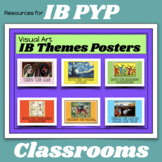 Two title headers for a PYP bulletin board are included. 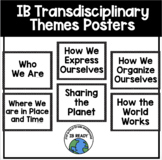 IB (International Baccalaureate ) PYP Transdisciplinary themes classroom posters in bright and chalkboard style. Back to school.You will have the poster with picture, title and definition. Also, poster with title and picture.Hope you like it! 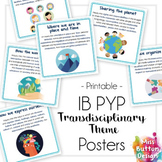 This is a set of Year 5 PYP Transdisciplinary Theme Posters (Where We Are in Place and Time, How the World Works, Sharing the Planet, How We Organise Ourselves, How We Express Ourselves, Who We Are). This set has been designed with a more modern look, rather than the traditional teaching aid look. 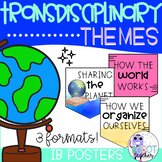 PYP Transdisciplinary themes poster IB transdisiplinary themes listed in a colourful poster format.